Hello everyone! It’s Vicki here today and I thought I would share with you how you can easily add a little sparkle to your cards with 3D Foam Shapes, Crafty Power Tape and a little glitter- a technique we call Wear Your Adhesive on the Outside. 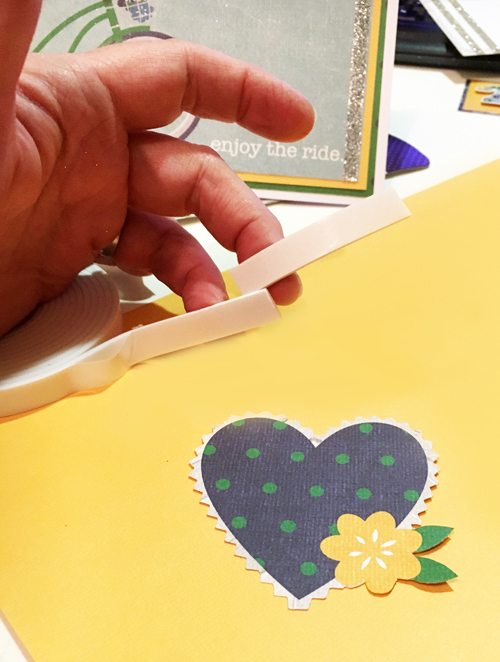 With just a couple simple additions, you can turn a cute card into a “Wow” card. First of all I love adding some dimension so after cutting my heart and flower out, I added them to my card with Crafty Foam Tape. I use this on almost all my cards, because I just love the way it makes the focal piece stand off the page a bit. Now, for the sparkle! I added a accent strip of glitter down the right side of the card simply by adding a strip of Crafty Power Tape to the main image piece and sprinkling a little glitter over it. It’s like making your own sparkle washi tape. 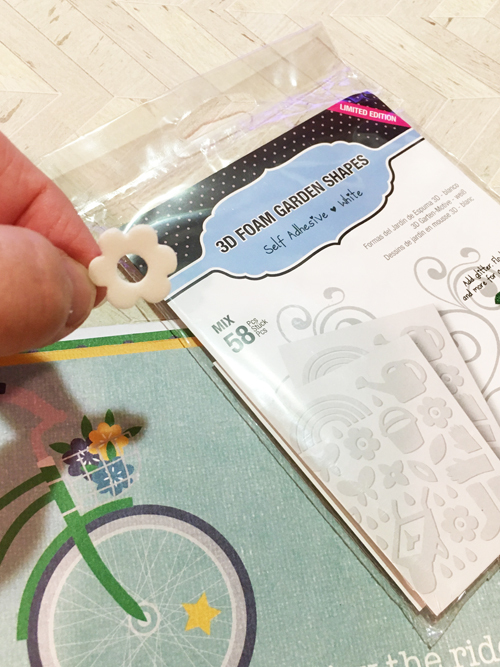 While you have your glitter out, it’s a great time to add a little to some 3D Foam Shapes to use as embellishments on your card. 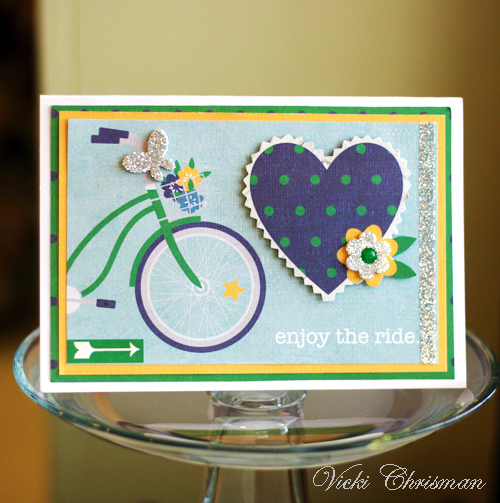 I thought the butterfly and flower from the 3D Foam Garden Shapes would be perfect for this card. Just like that, your 3D Foam piece is ready to add to your card. Since they are sticky on both sides, not additional adhesive it needed. 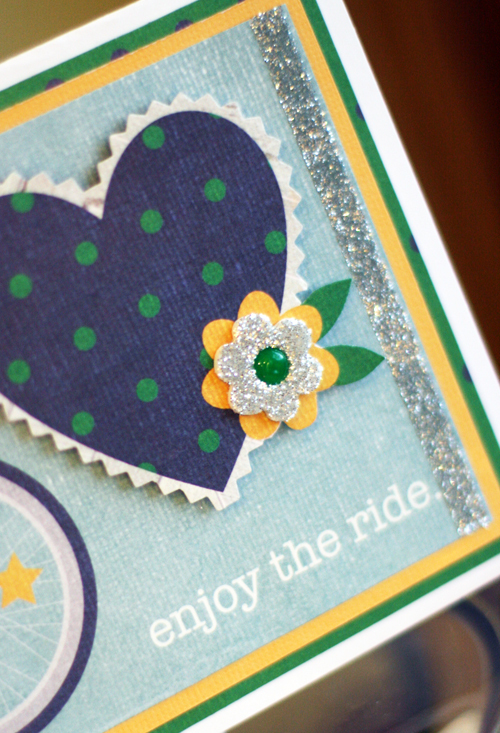 My “Springy”, and sparkly card is now ready for the mail! This entry was posted in 3D Foam Shapes, Adhesives, Cards, Crafts & Tutorials, Crafty Foam Tape, Crafty Power Tape, E-Z Runner® Dispensers, Seasonal Craft Ideas, Spring, Tutorial, Wear your Adhesive on the Outside and tagged 3D Foam Garden Shapes, Adhesive Value Pack, Card, Card Making, Crafty Foam Tape White, Crafty Power Tape 20' Dispenser, Crafty Power Tape 20' Refill, Crafty Power Tape 81' Dispenser, E-Z Runner Grand Dispenser, Simple Stories, Vicki Chrisman, Wear Your Adhesive on the Outside. Bookmark the permalink. 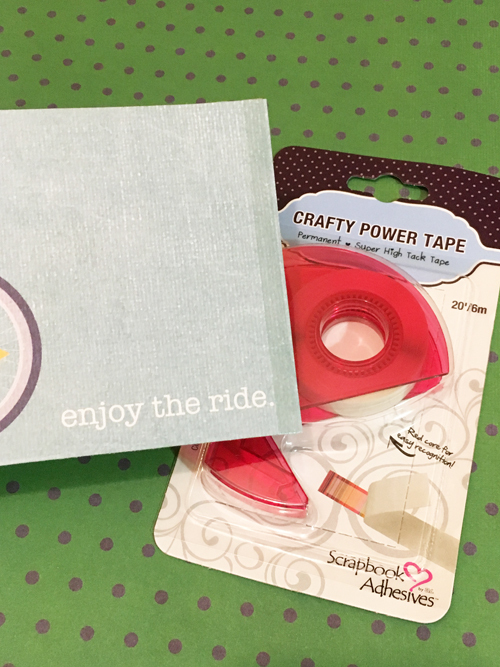 One Response to "“Enjoy the Ride” Card with Crafty Power Tape, Foam Shapes and Glitter"
How cute. I love their tape! Super stick power.